The post World War II migration of young couples from Youngstown’s older neighborhoods created brand new settlements on the city’s southwest side. It also created a need for a new parish, which the people could call their own. It was at that time that Mr. Fred Shutrump, widely known contractor and businessman, approached Bishop Emmet M. Walsh and offered as a gift seven acres of land for the establishment of a new parish. The bishop accepted the gift of land and acceded to Mr. Shutrump’s request that the new parish be named in honor of his mother’s patron saint, Saint Christina. 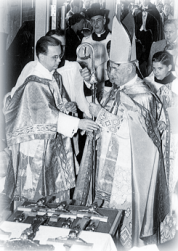 Accordingly, on March 19, 1953, the feast of Saint Joseph, Bishop Walsh established Saint Christine Parish and appointed Father Gordon G. Gutman, as the founding pastor. An announcement in the newspaper drew some 300 people to the first Mass of the new parish on Easter Sunday, April 5, 1953 at Mill Creek Park’s Pioneer Pavilion. As attendance steadily grew, Mass sites were moved to Idora Park and a little later to Princeton Junior High School. Parishioners of the growing parish began to raise funds for a church and school. 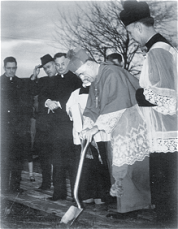 Ground breaking for the new facilities was held on Sunday afternoon, March 28, 1954. After hard work and the anxieties accompanying any building project, the buildings – comprising a combination church and school, rectory and convent – were blessed and dedicated on Sunday, November 13, 1955. What was remarkable about the early days of the parish was the involvement of so many parishioners under the leadership of Father Gutman in the actual building of the parish facilities. Significant to the development of the parish was the presence of the Daughters of Charity from Emmitsburgh, Maryland. In 1955, four Daughters came to Youngstown and opened the parish school. The sisters were present here until 1988. The highest number of sisters present at any one time was 17 when the school enrollment peaked at 1554 pupils in 1965. Today there are nearly 500 pupils enrolled in our school, with another 500 pupils enrolled in the religious education program or CCD. Through the years, competent and dedicated lay women especially, have taken over the administration and teaching responsibilities in the school, the religious education program and a pre-school begun in 1985. By the early 1960’s, the only building still to be constructed was a permanent church. Accordingly, Leonard Friedman, a parishioner and Architect, designed a contemporary looking place of worship incorporating many of the liturgical reforms of the Second Vatican Council soon to be implemented. 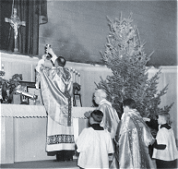 Bishop Emmet Walsh dedicated the new church on the feast of All Saints, November 1, 1964. The years following the dedication of the new church and the conclusion of the Second Vatican Council, were taken up, as in other parishes, with the implementation of the reforms of the Council. These included principally reforms of the Church’s liturgy and sacraments and the call to greater lay participation in the work and ministry of the parish. In 1973, after 20 years as founding pastor, Monsignor Gordon Gutman retired and Father Thomas F. Kelly was named the second pastor. Under his leadership, the “Christ Renews His Parish” renewal program was instituted in November 1976, and since then hundreds of men and women have participated in the “Renewal Weekends,” and gone on to further involvement in the parish. In 1990, Msgr. Kelly retired as pastor and Father David W. Rhodes, a former Associate Pastor, was named the third pastor. In 2012, Reverend Father John Edward Keehner was named as the fourth pastor of St. Christine Parish. Over the past fifty years, 26 priests have served the parish as Associate Pastors, bringing a variety of gifts, talents and personalities. The parish has also benefited from the service of four Permanent Deacons. In 1996, a Sister of the Humility of Mary, joined the pastoral staff as the first woman religious Pastoral Associate for the parish. Saint Christine Parish continues to be a vibrant parish having grown from a membership of 350 households in 1953, to a membership of approximately 3,000 households in 2003. Annually, approximately 100 persons respectively are received into the community of the church through Baptism; make their first reception of Eucharist and Confirmation; and are buried according to the Rite of Christian Burial. And so the cycle of life and death goes on. But Saint Christine Parish remains a place where faith is planted, nourished and celebrated. L-R: Msgr. David Rhodes (1990-2012), Msgr. Gordon Gutman (1953 -1973), Msgr. Thomas Kelly (1973-1990).